Last Monday was another great day for the UK team. 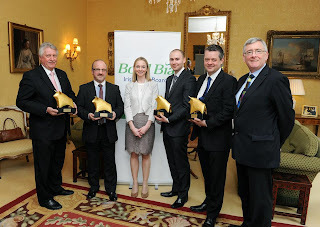 We were invited by this year’s Bocuse d’Or meat sponsor, Bord Bia, to attend a celebratory reception at the Irish Embassy in Grosvenor Place, London. It’s not every day that you have the opportunity to dine in such a venue and it was great to be among chefs such as Henri Brosi, Paul Gayler and Kevin Love from the Hinds Head. We listened to an inspirational talk from this year’s Bocuse d’Or butcher, Jean Denaux who’s love of Irish Hereford Beef has helped Bord Bia break into the French market. Thanks to Jean, Irish beef is now served in many of France’s top restaurants. The true highlight came when we were presented with our ‘golden bull’ trophies by Bobby McDonagh, the Irish Ambassador and Michelle Butler, general manager at Bord Bia. It brought back memories of Lyon and gave us all something to smile about.